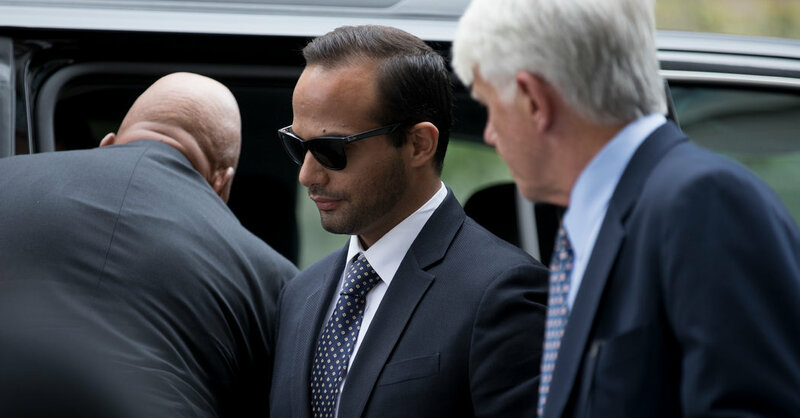 WASHINGTON — George Papadopoulos, a former Trump campaign adviser, was sentenced on Friday to 14 days in prison for lying to the F.B.I. about his contacts with Russian intermediaries before the 2016 election, with the judge saying he wanted to send a message to the public about the consequences of impeding an inquiry of national import. Mr. Papadopoulos, who pleaded guilty last year, is the first Trump campaign adviser to be sentenced as part of the continuing investigation by the special counsel, Robert S. Mueller III. Three others pleaded guilty or were convicted of felonies and await sentencing. Though lying to federal investigators is not typically punished by incarceration, United States District Judge Randolph D. Moss said that Mr. Papadopoulos deserved prison time because he had deceived investigators probing “a matter of grave national importance.” He also fined him $9,500 and ordered him to complete 200 hours of community service and one year of probation after his release. Prosecutors argued that Mr. Papadopoulos’s repeated lies during a January 2017 interview with federal investigators stymied the inquiry at a critical moment. In part because Mr. Papadopoulos misled authorities, they said in court papers, they failed to arrest a London-based professor — suspected of being a Russian operative — before he left the United States in February 2017, never to return. During an interview with The New York Times this week, Mr. Papadopoulos, 31, for the first time gave his own account of why he deceived F.B.I. agents after they arrived at his house in Chicago in January 2017 asking about any connections between the Trump campaign and Russian intermediaries. “I wanted to distance myself as much as possible — and Trump himself and the campaign — from what was probably an illegal action or dangerous information,” he said. At the time of the F.B.I. interview, he said, he was being considered for a job in the Trump administration and was concerned about where the escalating investigation might lead. He made no suggestion that anyone else on the Trump campaign or in the administration had directed him to lie. Mr. Trump sought to distance himself from Mr. Papadopoulos in comments to reporters aboard Air Force One on his way on Friday to Fargo, N.D.
Mr. Papadopoulos, who pleaded guilty last October, said he believed that the Mueller investigation was legitimate and fair-minded. But he said he had no knowledge of whether top Trump campaign officials conspired with Russia to disrupt the 2016 election. In court papers, defense lawyers had argued that Mr. Papadopoulos should be treated more leniently than Alex van der Zwaan, a Dutch lawyer who pleaded guilty to deceiving the special counsel’s office about his work for Paul Manafort, the president’s former campaign manager who was convicted last month on fraud charges. Compared with Mr. van der Zwaan, an experienced member of a powerful international law firm, Mr. Papadopoulos was naïve about the legal consequences of misleading federal investigators, they said. Mr. van der Zwaan served a 30-day prison sentence. Judge Moss said that while the cases were similar, Mr. Papadopoulos’s offense was more serious because he misled investigators about “a matter of enormous importance” to the integrity of the nation’s political process. He “elevated his self-interest over the national interest,” he said. On the other hand, he said, Mr. Papadopoulos seemed truly contrite, and so deserved to spend less time behind Mr. van der Zwaan, who showed little remorse at his sentencing hearing. Mr. Papadopoulos was a 29-year-old with relatively little foreign policy experience when Mr. Trump named him in March 2016 as part of a team of campaign advisers. It was a month after that when the professor, Joseph Mifsud, told Mr. Papadopoulos that the Russian government had thousands of emails that might damage Hillary Clinton’s candidacy. Mr. Mueller’s prosecutors revealed the existence of this exchange in court papers filed in October, and a lingering mystery in the months since has been who in the Trump campaign — if anyone — Mr. Papadopoulos might have told about the Russian dirt. In the interview with The Times, Mr. Papadopoulos said he had “no recollection” of telling any of Mr. Trump’s advisers about the emails supposedly in Russia’s hands. On the day he had the meeting with Professor Mifsud, he said, he was supposed to have a phone call with Stephen Miller — a campaign policy adviser and now a senior White House official — but the scheduled call never happened. Mr. Papadopoulos discussed the Russian information during a meeting in a London bar in May 2016 with Alexander Downer, the top Australian diplomat in London, The Times revealed in December. The Australian government passed the information to the F.B.I., which used it that summer as a basis to open an investigation into possible ties between the Trump campaign and Russia. Mr. Papadopoulos said that he remembered a great deal from that meeting with Mr. Downer, which he described as confrontational, but he had no memory of discussing the dirt about Mrs. Clinton. Until this week, Mr. Papadopoulos had given no public interviews since he pleaded guilty. But he has updated his whereabouts frequently on Twitter — sending a gallery of selfies taken with his wife in chic bars and on exotic beaches. It is his wife, Simona Mangiante Papadopoulos, who has served as his spokeswoman, defending her husband in frequent television interviews and making public pleas to President Trump to pardon him. Mr. Papadopoulos said he was not expecting a pardon and would not actively seek one.